Captain Spock has sadly indeed gone to explore the final frontier (Leonard Simon Nimoy - March 26, 1931 - February 27, 2015). At 83 Terran years of age, Captain Spock, now Ambassador Spock, finally succumbed to end-stage chronic obstructive pulmonary disease. He is survived by his wife, Susan, and his two children: Adam and Julie. Our thoughts and prayers are with his family. We will always remember him as one of the best - if not the best - Captain of the Enterprise. Spock: "Do not grieve, admiral. It is logical. The needs of the many outweigh ..."
Kirk: "the needs of the few,"
Spock: "Or the one ..." I never took the Kobayashi Maru test, until now... What do you think of my solution?" Spock: ""I have been and always shall be your friend. Live long and prosper." His soul was indeed the most "human." 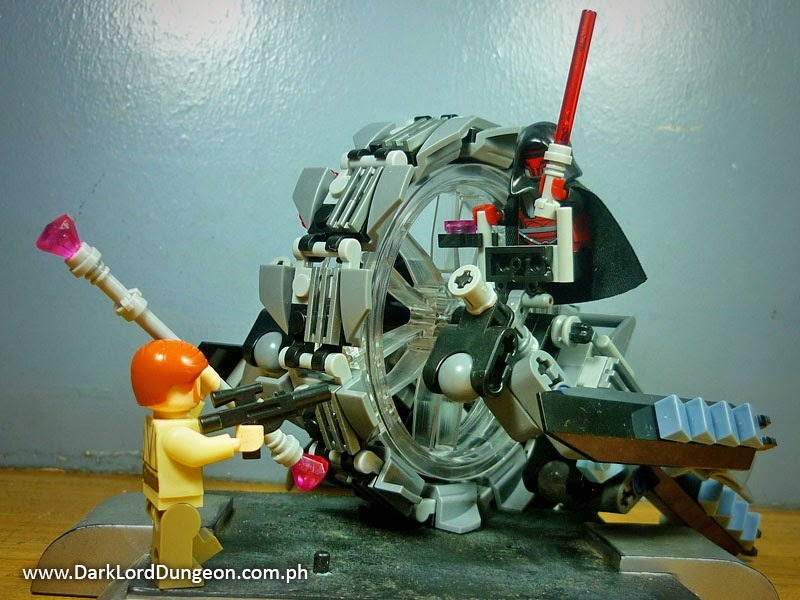 Presenting the STAR WARS KO Lego version of the Wheel Bike of General Grievous. To the uninitiated, this is a Tsmeu-6 Personal wheel bike. It was meant as a reconnaissance vehicle by Z-Gomot Ternbuell Guppat Corporation, till some madman discovered and relished in the idea that a big-spiked wheel traveling at 330kph can sow a little "damage" to arrayed troops - at the very least it will clear a path. 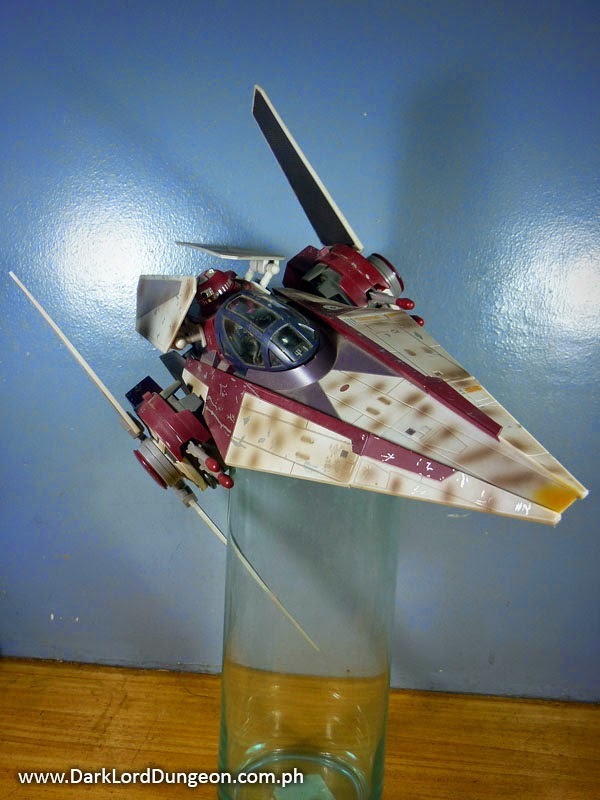 General Grievous made the Tsmeu-6 personal wheel bike even more... grievous.... by removing the passenger seat and arming it with an ND-53 Double laser cannon. And the bad boy had at least three of them made. 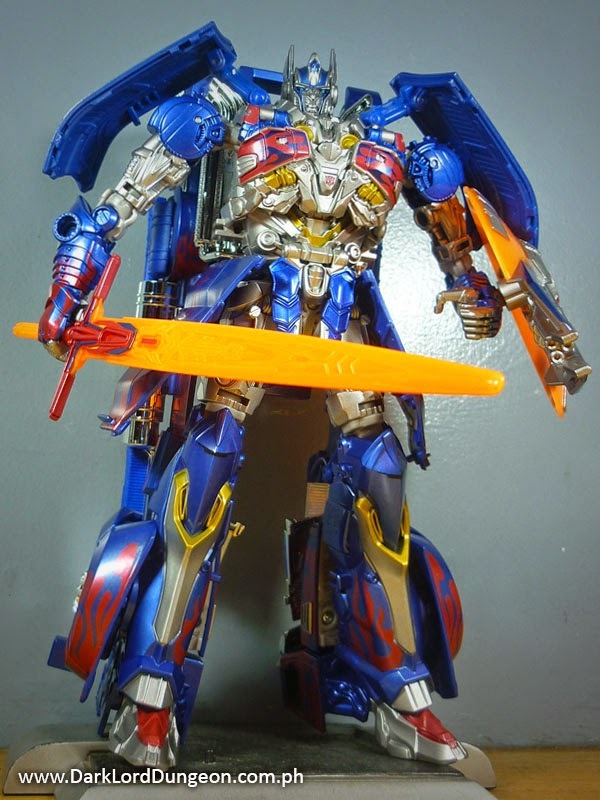 Presenting the Takara Armor Knight Optimus Prime from the Transformers Age of Extinction (AOE) toyline- AKA the Takara AD31. When we first saw the Armor Knight Optimus Prime on the internet, we thought "Oh great! Another repaint released because the toyline wasn't selling." Yes, while we thought that the Takara AD01 was decent and we loved the design elements that went into it, there was nothing that would make up purchase the regular Hasbro version because it was crappy in comparison to the ROTF and DOTM Voyager Class Optimus Primes that we've come to love. But when we saw this on the shelves, all we could hear was Bruno Mars singing "Gottta kiss myself I’m so pretty. I’m too hot (hot damn) Called a police and a fireman. I’m too hot (hot damn) Make a dragon wanna retire man. I’m too hot (hot damn) Say my name you know who I am...." coming from the snobbish package. Presenting Jinx from the GI Joe Retaliation Toy Line. Yes. Two years after the release of the GI Joe Retaliation movie, we finally got our hands on the ultra-expensive and hard-to-find Jinx action figure (Of course we're still looking for the unmasked and red-masked SDCC versions - or the really, really expensive Kim Arashikage figure - if only they were cheaper). To the uninitiated (Really? Why are you here?) this particular Jinx was portrayed by Elodie Yung in the GI Joe Retaliation movie. Jinx was more or less a supporting character who was struggling to earn the respect of Snake-Eyes who mistrusted her primarily because Jinx was the cousin of his nemesis Storm-Shadow. Jinx was with Snake-Eyes in the battle of a red-ninja filled mountain to kidnap Storm-Shadow. It is during that battle that she wore this yellow-jacket ninja outfit which ran contrary to her traditional cartoon incarnation red outfit. 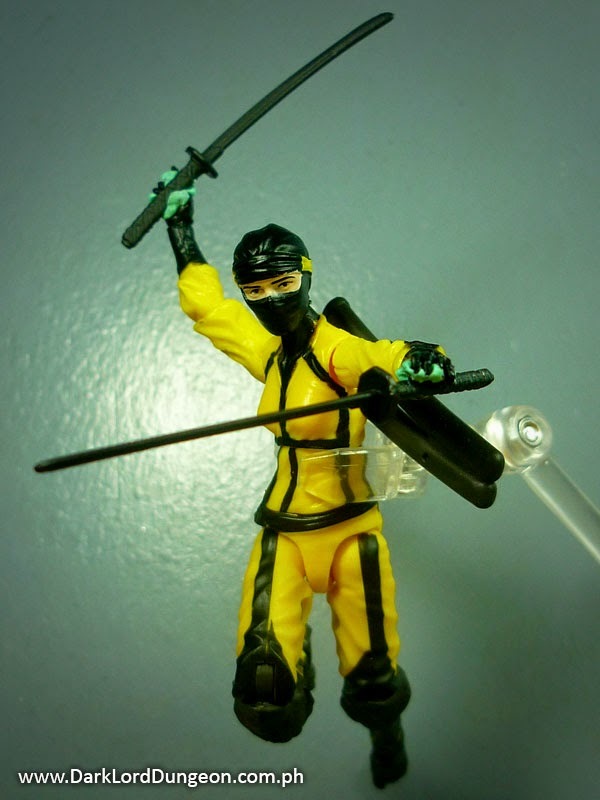 This was probably done to help distinguish her from the rest of the red ninjas (Black was taken by Snake-Eyes). Or GI Joe Retaliation director John Chu is a fan of the Power Rangers. 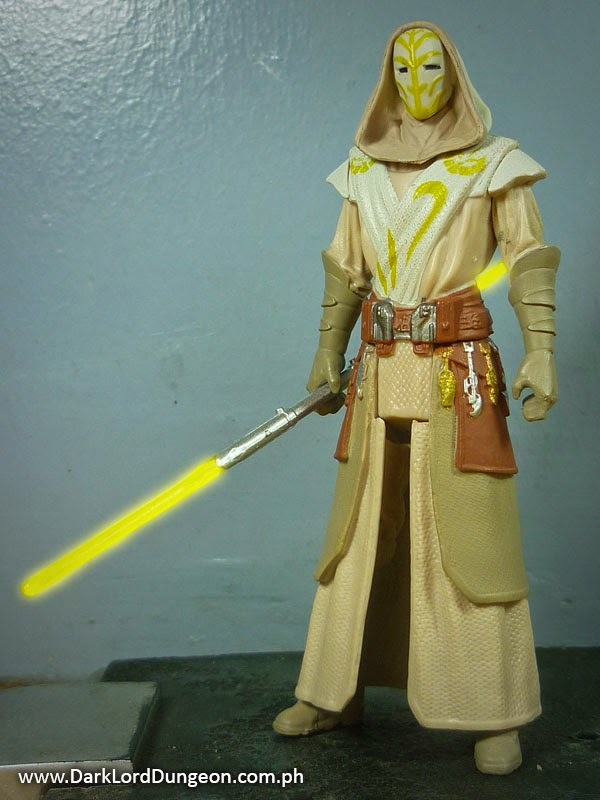 Presenting the Star Wars Jedi Temple Guard from the Star Wars Rebels toyline. This will be a very short review. You'll realize why a little later on. To the uninitiated, the Jedi Temple Guards were Jedi who were dedicated to the protection of the Jedi Temple on Coruscant - a position considered to hold great honor. As Jedi - to be distinguished from the regular non-Force Sensitive security guards - they reported directly to the Head of Security, which during the time of the Clone Wars was the Legendary Battlemaster, Jedi Master Cin Drallig. Cin Drallig was a master of ALL seven forms of lightsaber combat and was considered unmatched as a swordsman. Ironically he would die at the hands of his pupil Darth Vader during Oprtation Knightfall. Which is also when, presumably, all of the Jedi Temple Guard died as well. 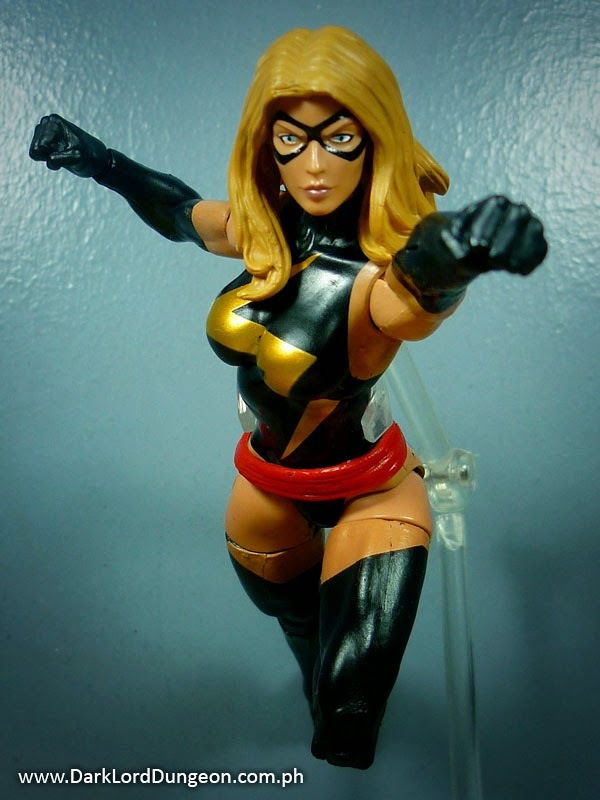 Presenting Ms Marvel from the Marvel Legends Infinite Series. Carol Susan Jane Danver has been known by many names. She started her super-hero career as Ms Marvel, but then was depowered by Rogue, and then mutated by the High-Evolutionary whereby she became the Starjammer known as Binary; She then lost most of those really almost Phoenix like powers when she saved the Earth's sun and returned to her Ms Marvel level powers but adopted the name Warbird instead. Later when she rejoined the Avengers, bent on becoming popular, she became Ms Marvel again. Today though, following the death of Captain Mar-Vell (Again? ), she adopted the name Captain Marvel and having lost her memories to a massive brain lesion, she has again left the Earth and is currently with the Guardians of the Galaxy - at least we think she is since she's also on Steve Rogers side of the current hero-in-fighting in the Avengers. Also known as the V-Wing Starfighter or Nimbus Starfighter. The V-Wings can be seen towards the end of Episode III first as escorts to the Emperor's personal shuttle when he went to pick up the "remains" of Anakin Skywalker, and then a bit after when several of them are seen patrolling the space around the construction of the first Death-Star - which would take almost 19 years. Developed by Kuat Industries, the V-Wing were developed at the same time as the Eta-2 Actis-Class Jedi Interceptor (Which replaced the Delta-7 Jedi Interceptor whose nose cone the V-Wing draws inspiration from) hence both fighters employ S-foils. But unlike the Eta-2 Jedi Interceptor whose S-Foils are flush against its hull, the V-Wing's S-foils run parallel to the body of the starfighter and open up like a "vee" to run perpendicular to the body of the V-Wing - hence the name "V-Wing."